Tropical Darwin offers a relaxed outdoor lifestyle combined with multicultural experiences, exciting wildlife encounters and fun events. It’s a small city, and easy to get around. You won’t find skyscrapers and high-rise buildings here, everything about Darwin is down-to-earth. Sacred Aboriginal sites exist in and around Darwin, where you can learn about the world’s oldest living culture. Darwin also played an important role in Australia’s WWII history and many relics remain from this time. Much of the city's social activities take place at open air markets, outdoor festivals, in parks and reserves, by the beach or on boats down on Darwin Harbour. 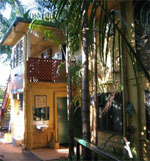 Mitchell Street is the heart of Darwin’s restaurants and pub scene. The Darwin Waterfront Precinct and Mindil Beach night markets all offer entertainment, while the sleepy suburb of Parap on the outskirts of the city has some of the best collections of indigenous art in Australia. Surrounded by sea on three sides, Darwin is an excellent base to explore Kakadu National Park, Litchfield and Nitmiluk national parks, the Tiwi Islands and Arnhem Land.